Official Opening: there at last! The Lord Lieutenant, official host for royal visits, and a patron of HCPT, presented the High Sheriff, Ludlow MP Philip Dunne (also a patron) and Trust officers to HRH who, as a trained architect, took an informed interest in what he saw on a tour of the interior and exterior works. He met some of the specialists responsible for what is generally agreed to be an achievement of high quality and, in important respects, successfully innovative practice (see below). The Duke also met representatives of the major sources of project funds, including Heritage Lottery Fund, English Heritage, local councils and private trusts, whose imagination and commitment made the project possible. To the credit of HRH and the Lord Lieutenant - and their teams - that a relatively complicated event passed off in a relaxed and warm atmosphere (although we shivered in the cold). The Duke performed the various official parts of the ceremony  ribbon-cutting, plaque-unveiling, commemorative book-signing and gift*-acceptance - with humour and what seemed a genuine appreciation of what had been done. His speech referred to the historical significance of castles as evidence of a more turbulent, less peaceful past; and to the aesthetic significance of Hopton Castle as a beautiful object in a very particular setting. At lunch**, there was relief at the conclusion of a rescue-and-renaissance challenge met by combined effort. Hopton Castle is now secure for future generations (and the car park is a bonus)! ** The events of the day were sponsored by a number of local enterprises. Contact Tom Baker if you wish to know more. A particular feature of the HC project development has been the collaborative working between the funding organisations, specialist teams and the Trust, often in response to unique problems. Visitors (there had been hundreds even before the official opening) have commented on the beauty of the reconstructed arches, the elegance of the structure now revealed and the impact of the new approach, all of these the result of negotiation. The much-admired artwork of the interpretation boards and the 'stunning' metal-leaved book brings to life the reasons for saving HC which were shared by all those involved. The largest grant (£880K) came from Heritage Lottery Fund. English Heritage provided c£250K and significant funds by various branches of Shropshire Council (and the former South Shropshire Council). Local enterprises and individuals have given immensely generous support in finance and in kind and we have benefited from European money, too. There are, of course, annual maintenance and insurance costs and the Trust would love to be able to fund further work on the mediaeval walls and evidence uncovered by the Time Team. That is the next challenge! If you wish to know more about funding details, please contact Tom Baker (see below and the Contact Form on this website). The Trust has been supported, as ever, in its securing of the initial funding and then money for additional work by the Secretary, Tom Baker, and Project Manager Sula Rayska. 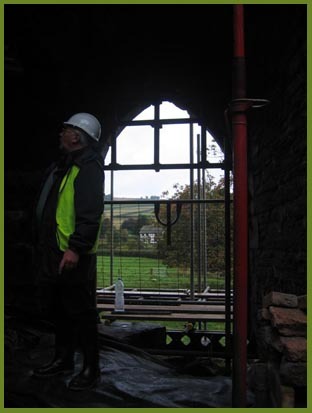 The quality of the work to date has depended on the expertise and commitment of Conservation Building Services led by Ian Storey (Director) and Adrian Harrison (site manager); and Richard Morriss of Richard K Morriss and Associates (archaeologists); and John Wheatley and John C Goom (architects). 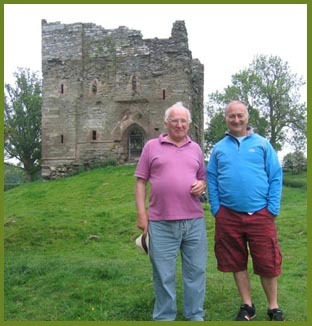 In June 2009, by agreement with the Trust, the Time Team production team visited Hopton Castle site. In a week of soaring temperatures and then heavy rain, a team of about 50 set up, dug, recorded and filmed. The whole process - the dig really is allocated only 3 days but there was meticulous preparation on Monday and tidying after Thursday - was extremely efficient and the relationship with the Trust wholly positive. The subsequent programme concentrates on the story of the Siege although there was a great deal of new information about the medieval buildings. Finds broadly confirmed the quality, and, by implication, the original status of the Castle. The Trust wishes to record its appreciation of the professionalism and courtesy of the team which arrived out of the summer haze on Monday and squelched away at the end of the week, having left everything as they found it.The dig report from Wessex archaeology (for Time Team) recorded a wide range of finds, amongst them a Roman coin, a human tooth, a huge cannon ball and a beautiful gold James I quarter laurel. We will post more photographs once the Trust has access to the 'Hopton Hoard' (not really substantial enough to earn the title, but still significant in the Castle's history).